Before editing the Advent Calendar templates, it is important that you watch our video tutorials and learn more about the Draw Feature. When editing, make sure that all the hidden components are revealed. Each lock has a Time condition, which ensures that your audience can open a daily offer on a specific date. Tip: To view or test your page, cut the Time Condition. When you finish testing, paste the condition back. You can choose your Page Timezone from the dropdown. Once the date is unlocked, your audience can access the game by filling the Lead Form and get a chance to win the prize. To edit the game, go to Game Stage. Now each advent calendar template has different details, so find your template below for specific guidance. If you wish to change the background image or graphic elements of the game, simply drag the Game Floating Container outside the game frame. To see the cards underneath the Scratch Components, hover over the Reveal component and click the Eye icon. The image is connected to the Draw, which means that the cards will be shown based on the draw results. Go to the Draw and replace the image address of Card 1, Card 2, and Card 3. The wheel animation is controlled by degree number placed on degree column in the Draw. It spins 3 times before the result is shown. 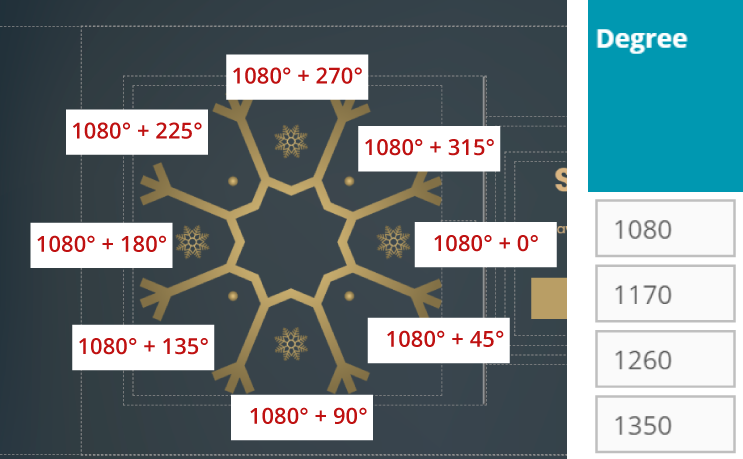 A prize case: 1080° + degree with a winning field. The calendar components are placed inside the Ratio Container. Go to Data in the right-side menu and go to the Prize Images group. Change the images currently there, with your own 24 images of daily prizes. Use Page Overview and click on the popup you want to change. If you e.g. want to change the text shown 1st of December, click on Day 1 from the overview. From here you can apply your changes. When the winner should be selected. Remember to configure this to match your own time zone. The number of prizes to give away. All the Quiz Contests of this template are set to draw two winners: one winner and one back-up winner, in case the first winner does not respond. Go under Data & Analytics > Apps for your page and then select which day to see the winners from the drop-down menu. Go to Data in the right-side menu. Here you have a data group called Prizes, that contains a total of 3 prizes with links to images. To update the prizes, simply replace the default images with your own. You can also add more prizes, by adding new data fields and uploading more images. Go to Actions in the right-side menu and choose Prizes to show. Located here are 24 Action Sets with conditional rules based on what day it is. There are 3 actions for each action set, which correspond to the 3 images you see in the popup – each pointing to the images configured in the previous step. By changing what image is being used, you change what prize will be shown and in what position. To pick a random winner you must go to the Draw linked to the page. Here you can request any number of names to randomly be drawn and exported. Go under Data & Analytics > Audience > Add Fields. Select to show Email together with the field corresponding to what day you are checking. Now, go under Filter and make a search for the email of the winner – remember to click Apply. Whether the person choose product 1, 2 or 3 will now be shown.